Contrary to its name the German Longhaired Pointer is an all-around gundog, not just a pointer. It is capable of pointing, trailing game, flushing and retrieving from both land and water. The German Longhaired Pointer originates in Germany and is closely related to the other German Pointers, the Shorthaired, Wirehaired and Rough Haired. 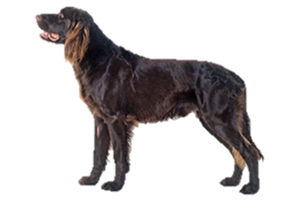 They were bred from early German gundogs with later additions that may have included the old Water Spaniel, Gordon and Irish Setters, Newfoundland, and French Spaniels. Later the German Longhaired Pointer would become the ancestor to the Large Münsterländer, selectively bred by those fanciers that preferred black and white color variation that was left out of the Longhaired’s standard. Is the German Longhaired Pointer Right for You?